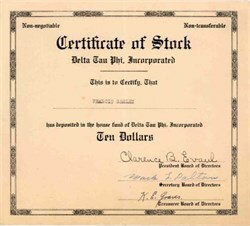 Beautifully engraved certificate from the Delta Tau Phi, Incorporated. This historic document has an ornate border around it. This item is hand signed by the Company’s President, Treasurer and Secretary.